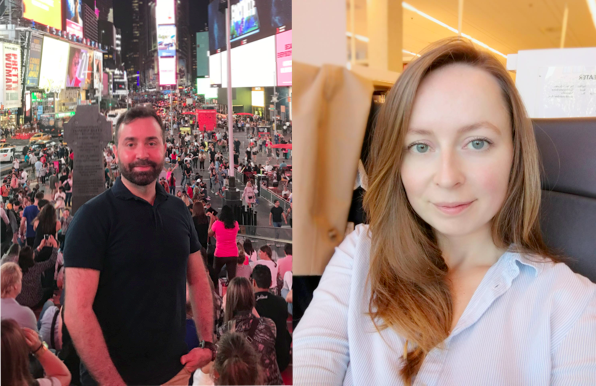 We have got a wonderful chance to get to know JCI Stockholm Local President 2019 Hamid Rasoul and JCI Sweden National President 2019 Simona Bockute (JCI Gothenburg). They answered the questions and are ready to take over officially when the year changes. As you can see from the answers below, there are lots of things already happening behind the scenes and these presidents also have expectations towards members. Let’s answer to the call and get ready for 2019, everybody! 1. What goals do you want JCI Stockholm / JCI Sweden to achieve in 2019? Hamid: To do at least 2 projects with our members that create positive impact, and to make JCI Stockholm grow with at least 5 new active members. Simona: I want to see JCI Sweden united and growing. I want us to share our message that JCI carries to whole Sweden! 2. How are the preparations going with the new board? Hamid: On 17th November we will have our first meeting to work on action plan for 2019 and we are looking forward for it. Simona: Well, the first hurdle is done by being elected, but real work is only starting. We are planning out kick off in December, as well as the national Kick off in January. An exciting year awaits! Simona: Courage. Courage to take the lead and make impact. 4. What has been your biggest highlight in your JCI activities so far? Hamid: To accept the challenge of being a Local President for the first time in my JCI life (11 years). Simona: Jenni will be very happy again – I cannot stress enough the impact that JCI European Academy had on me personally and in JCI. If you haven’t been there yet, you must go! 5. What do you dream to be your biggest highlight in JCI next year? Hamid: I dream to make a big impact that makes JCI known to everybody in Stockholm. Simona: Dream big, right? JCI Sweden wıth 120 members. 6. What do you want to develop in yourself as a leader during a year as a president? Hamid: To learn how to lead a talented team and to keep them motivated and active. Simona: Expectation management. I want the national board and the members have appropriate expectations towards each other. That I promise to work on! 7. How do you plan to represent JCI Stockholm / JCI Sweden nationally and internationally in 2019? Simona: I am ready to travel. I already have my ticket booked for JCI European Presidents Meeting in Sofia, Bulgaria and planning to go to both JCI European Conference and JCI World Congress. Nationally I would like to visit every local organization at least once to help the members with their struggles or questions. I want all the members feel that they are a part of this big organization and that their work matters! 8. What do you wish for all our members, guest members, alumni and Senators as a message for 2019? Hamid: I wish them happiness, success, good health and I wish to see them more active with JCI in 2019. Simona: Be courageous! Take responsibility for your life, for your work, for your community, for your country. I want all the members of our community to do something next year to contribute to the impact and growth of JCI Sweden. Only together we are strong and make the difference! Are you ready for it? 9. Where do you see yourself in JCI in 2021? Hamid: If everything goes as planned during my local presidency in 2019 then hopefully I will join the national board on 2021. Simona: I would like to be established in Sweden, in my work life and personal life especially. Let’s see what life brings :). Simona: Dear JCI Stockholm members, now is your chance to take and stand and make the difference. Be a volunteer for a project, start your own project or take the responsibility being a local board member. Take that first step and you will see the possibilities opening in front of your eyes. Go for it! P.S. Click for more information if you want to read the JCI Sweden Plan of Action 2019, JCI Sweden Strategy 2017-2020 or proposed 2019 JCI Plan of Action or 2019-2023 JCI Strategic Plan (will be voted on this week in JCI World Congress in Goa, India). JCI Stockholm Plan of action will be formed by the new board and voted on in the LP glögg event in December. TRAINING: What are you standing for as a leader?